The Gentleman's Groom Room is an independent traditional shaving and male grooming retail shop that occupies a lovely listed building in Dundee City Centre Scotland's fourth largest city. We pride ourselves on being a traditional gentleman's store and as such our product range has been carefully selected to appeal to our discerning clientele. 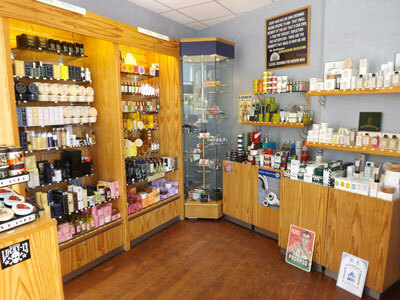 The interior has a retro-apothecary feel with a friendly, professional atmosphere and boasts an unrivalled selection of quite superb wet shaving and male grooming products from around the world. Timeless and traditional classics such as badger hair shaving brushes from names such as Simpsons, Progress Vulvix, Shavemac, G.B Kent and indeed our own run's of ltd edition brushes. Open razors and safety razors from world famous manufacturers including Muhle, Thiers Issard, Dovo, Merkur and Boker. Matchless fragrances from some very special houses such as Floris, Ineke, Castle Forbes, Czech & Speake , Geo.F.Trumper, Alvarez Gomez and Bois 1920 to name but a few. Traditional shaving soaps and creams including Proraso, Cella, D.R Harris,Taylor of Old Bond Street, Musgo Real and artisan makers such as Martin de Candre , Wickham Soap Co. and our own brand Essence of Scotland. Jack Black and Baxter of California are also included in our portfolio of high performing products to provide the very best in skin care. Hairdressing's, pomades and products for the beard and moustache from some of the best in the business, more contemporary brands such as Suavecito, Layrite, Reuzel , Schmiere, Uppercut , Apothercary 87 and Captain Fawcett to classics Black & White, Murray's, Morgan's and Truefitt & Hill the oldest barbershop in the world. The lower level of the store houses our Jermyn Grooming & Lifestyle Suite which specialise in bespoke male grooming treatments including traditional hot towel wet shaves, gent's facials, gent's manicures and range of massage treatments. The Gentleman's Groom Room was established in the early part of 2006 by owner Ian Thomson a traditional wet shaver for over 30 years with both DE and straight razors, but does admit to having a brief fling with a Gillette cartridge in this time. Ian is also fully qualified in the art of the traditional cut throat wet shave having trained several years ago with the wet shaving expert and master barber at Harrods in London when Mr Al Fayed had private ownership, he has a professional knowledge of traditional Turkish wet shaving including singeing and was also instrumental in the creation of the Internationally renowned Essence of Scotland range of traditional shaving soaps. The Gentleman's Groom Room Traditional Shaving Shop has over the years built up strong connections with Jermyn Street and St James's London, an area which is synonymous with the finest quality shaving and grooming requisites and the store are official authorised stockists of Czech & Speake, Geo.F. Trumper, Floris, Truefitt & Hill , D.R Harris and Taylor of Old Bond Street to which we are also the authorised Agent/Wholesale distributor for Scotland. Dundee is situated in the north east of Scotland, set on the banks of the River Tay. At the heart of Scotland The Gentleman's Groom Room is easily accessible from Glasgow, Edinburgh and Aberdeen and located less than 25mins from Perth and St Andrews The Home of Golf in the Ancient Kingdom of Fife. The Gentleman's Groom Room would like to warmly welcome you to our shop anytime you may visit the city or surrounding area. For those where this is just not possible, we hope that you enjoy using our website.